Available all-wheel drive or front only, Hilux is able to satisfy all your needs with a wide range of versions, fitting outs and engines. Built for work, leisure and adventure, Hilux is able to manoeuvre in environments that have the most extreme conditions in the world. 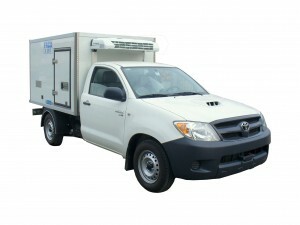 Contact us for all the information for a cold storage to be installed on the Toyota Hilux.